Thanks to Daily Candy for linking to this. Looks like a pretty smart invention to me...especially since it comes in lemon-honey flavor too. Brilliant. And not expensive. And pretty spiffy. Basically, it's dried (non-sticky!) 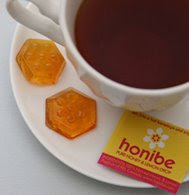 honey, pure and delicious, in individually-sized portions, travel-friendly and kind of pretty. All-natural honey, minus the mess? So smart!